By linking your website to ours, visitors will have access to all the content from www.saveinvermay.co.nz. We’d love to have you join the cause by adding our logo to your website now. Save Invermay has a Twitter account, a YouTube channel and connects to the Facebook page Stand Up Otago . These channels are a great way to get to know those who share a passion for retaining Invermay as a scientific hub and saving New Zealand’s Genomics programme. Visit all of them and get connected. If you have agricultural or science news or an opinion to share, connect to Stand Up Otago on Facebook or email the Minister directly using our link. Are you writing an article or do you need tips for a newsletter, a blog or a school paper? Save Invermay has plenty of ideas and tools to share. Feel free to share our 10 reasons for Saving Invermay, the link to our Information Toolkit, download BERL’s economic analyses, or play the videos of those concerned about Invermay’s future and what the Minister and AgResearch have to say. Invermay gives New Zealand farmers and business people, just what all people in business are looking for – an economic edge. Despite that and against the advice of its own change management team AgResearch has decided to downsize Invermay and relocate most of its existing Invermay staff to Lincoln. When we look closely at the scientific reasons for making the move we find that genomics research will be hurt not enhanced by the move, when we ask for the economic reasoning, the reasons have been shown by BERL to be badly calculated. Help the Otago Southland region to retain Invermay and its group of world class scientists. Support our efforts by feeding us your stories about Invermay. We advocate for the retention of scientific knowledge and know-how in the southern region. 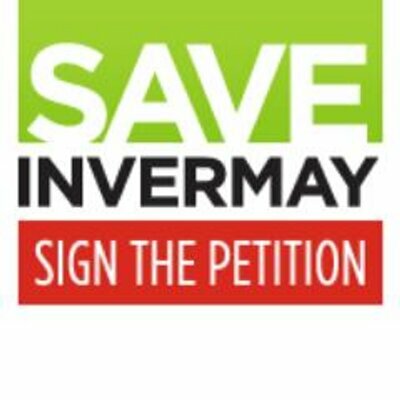 Help us make that happen, help us save Invermay. Join us. Click the image and copy the low resolution Save Invermay logo. Use it to get the word out, pass it on to your friends or use it on your blogs. Or check out our tool box on the home page and send the Self-Help Kit, to those who care about our scientific future. The Kit summarises the campaign, gives you details about who to contact and a copy of the Save Invermay petition. AgResearch announces the plans for its Lincoln hub. AgResearch announces it is going to downgrade Invermay after earlier intimating it was going to expand the campus. The Mayor of Dunedin Dave Cull calls on leaders across the lower South Island to step in and let the Government know how unhappy the South is at the rash of recent closures of government funded organisations – highlighted in particular by the plan to downsize Invermay. Councils and business leaders across the lower South Island meet in Dunedin to nut out ways of saving the south. The region politicians called on the Government to pay more attention to the provinces, saying they're suffering at the expense of the larger centres. Dunedin's mayor and the Otago Chamber of Commerce are leading the crusade to save jobs around the lower South Island. Southern delegation group announce enlistment of former MPs Pete Hodgson and Katherine Rich to help the fight to save 85 jobs at Invermay. AgResearch Chair Sam Robinson writes to Dunedin Mayor Dave Cull to tell him not to worry about having input into the proposal at this point as that will come after the consultation with AgResearch staff is completed. Delegation of Southern leaders including Dunedin City Council, Otago Regional Council, Otago Chamber of Commerce and Environment Southland go to Wellington discuss concerns with Minister Steven Joyce. Delegation says meeting was fair. Minister Joyce says Southern regions getting a fair deal. AgResearch confirms its proposal to create a hub at Lincoln and downsize Invermay. Leaked documents show that the AgResearch executive team rejected the findings of its its own change management team (CMT) appointed to consider the 245 staff submissions, agreed with many of the concerns. CMT recommended that key genomic, animal productivity and deer research scientists should remain at Invermay, rather than being concentrated at Lincoln. Further leaked documents show AgResearch was planning to expand Invermay only months before presenting plans to the Government to slash jobs at the facility. AgResearch's submission on the Dunedin's draft economic development strategy, dated June 15 2012, also said there was a ''unique'' opportunity to develop an ''agricultural science innovation precinct'' at Invermay because of the city's "knowledge and innovation base". During a visit to Dunedin Science and Innovation Minister Steven Joyce says opportunities were lost to strengthen research links between AgResearch's Invermay centre and the University of Otago. Mr Joyce said there had been plans for more co-operation between the two when the new Christie building was constructed at Invermay in 2008. But they were not put into action. The southern delegation fighting plans to downsize Invermay makes its case to AgResearch's board and management. The meeting was the first time that AgResearch met with Southern stakeholders about the loss of about 80 jobs at the facility. AgResearch remains stumm on how many staff will be lost as a result of restructuring, despite a request from Science and Innovation Minister Steven Joyce. A report by economic research consultancy usiness and Economic Research Ltd (BERL), analysing how AgResearch formed a plan to shift 80 jobs from its Invermay facility in Dunedin to Lincoln is highly critical of the Crown Research Institute. The report commissioned by the Dunedin City Council shows serious shortcomings in the justification for the move and what the economic benefits might be. Science and Innovation Minister Steven Joyce, however questions the objectivity of the report and BERL's independence. The chief of the company which found holes in AgResearch's case for cutting jobs at Invermay has fires back at comments by Science and Innovation Minister Steven Joyce questioning its independence and the quality of its work. And local politicians also spoke out, with Dunedin Mayor Dave Cull and Stephen Woodhead both attacking Mr Joyce for his criticisms of BERL. AgResearch chief executive Tom Richardson defends its restructuring plan at Federated Farmers' national council meeting in Wellington. Says opponents had made too much of Dunedin's "genetics hub", and Invermay’s relationship with Otago University . Says that in the field of genetics it only consisted of a few staff. Dunedin Mayor Dave Cull hit backs at AgResearch's claim that opponents of job cuts at Invermay have made too much of Dunedin's so-called "genetics hub". Says it's surprising that Tom Richardson is unaware of the breadth of the genetic capacity in the Otago area. It's well over 200 geneticists. In contrast, Lincoln University - which was part of the proposed Lincoln Hub - had almost no genetics capacity. Says the genetics effort ... is hugely important for the primary sector of our economy and, if it is a major component of AgResearch's effort, it seems very odd to move their part of it to somewhere where the capacity is almost non-existent. Minister Joyce refuses to answer a set of parliamentary questions about the Future Footprint Proposal by Dunedin North MP David Clark. To the great majority of questions he responded… I refer the Member to the latter part of my answer to Written Question 12935 (2013). AgResearch is accused of lacking transparency over its failure to release documentation supporting its plan to slash jobs at Invermay by Dunedin North Labour MP David Clark. AgResearch chief executive Tom Richardson disputes Dr Clark's claims, saying it had been transparent throughout the process. Government documents show AgResearch ''misled'' ministers about a report which recommended growing Invermay, former Dunedin North MP Pete Hodgson says. Mr Hodgson made the comments after looking over a second batch of documents on AgResearch's Future Footprint Plan released under the Official Information Act (OIA) by the Ministry of Business, Innovation and Employment (MBIE). The almost 200 pages of documents give further detail of just how heavily involved the Government was in the plan. MBIE staff and Minister of Science and Innovation Steven Joyce gave AgResearch direction over its building layout at the proposed Lincoln hub. AgResearch staff fear relocation plans will lead to the organisation losing its scientific firepower, according to a union survey. A Public Service Association (PSA) survey of 177 AgResearch members from around the country found that 80 per cent were concerned "about the impact of the plans on the science sector and related stakeholders". The survey found that only 1 per cent would be happy to relocate. DCC ramps up efforts to save Invermay, with the launch of its Save Invermay website. AgResearch chief executive Dr Tom Richardson expresses disappointment with release of PSA survey before the PSA had any discussions with AgResearch management or the staff involved. The survey showed more than 40% of the 104 respondents who had been told their positions would be moved as part of the organisation's Future Footprint plan, intended to retire or find work elsewhere, rather than move. Petition to reverse Invermay job cuts launched by Dunedin North MP David Clark. The office of Minister Joyce releases a redacted version of the full Future Footprint Business Case in response to an OIA request. University of Otago Professor Frank Griffin tells deer farmers attending a field day at Invermay to recognise they were "at the Mecca" for deer biological research. The AgResearch campus was looked on as the fountain of all knowledge,' and farmers should be aware of that and the prospect it might not continue. A survey showing 92.1% of sheep breeders are against shifting Invermay jobs north by Dr Jock Allison is unveiled. AgResearch call the survey biased . Of the 394 ram breeders sent the survey, 92.1% believed the approximately 60 positions in the sheep genetics and genomics group (SCG) should be kept at the Invermay campus as opposed to transferred to Lincoln, with only 1.3% saying the positions should be moved and 3.8% not responding. - About 100 Otago and Southland farmers confronted four AgResearch board members and four management representatives at a heated meeting in Gore, leaving them in no doubt of their opposition to the plan. At the Beef and Lamb New Zealand-supported meeting they passed a resolution rejecting the plan to shift the animal genetics unit to an expanded research hub at Lincoln, and called on Science and Innovation Minister Steven Joyce to order an independent review of the decision-making process. Minister Joyce was then urged to hold a full independent inquiry into AgResearch’s restructuring plans by Labour’s MP for Dunedin North David Clark. The Minister declines. Beef and Lamb New Zealand's annual meeting calling on AgResearch to "extend its level of consultation" and "consult with commercial ram breeders in the North and South Island". Organisers of a sheep breeders' meeting on possible downsizing of Invermay research facility say AgResearch management must seriously consider the message that to move Invermay scientists and research capabilities to a facility in Lincoln would be a damaging blow to the sheep and deer industries in Southland and Otago. AgResearch chief executive Tom Richardson says he came to dispel myths surrounding the changes at Invermay and reaffirm AgResearch's commitment to regional science. It called on AgResearch to extend its level of consultation and consult with commercial ram breeders in the North and South Island. Top AgResearch scientist Susanne Rasmussen, a metabolomics scientist from Palmerston North resigns over a the controversial relocation plan and warns the project is doomed to fail. Says most scientists, particularly those who are world-class, will find jobs elsewhere or take early retirement. The Crown research institute intends to shift 250 staff to two new hubs in Lincoln and Palmerston North by 2016 as part of its $100 million Future Footprint restructuring. Dr Rasmussen painted a bleak picture of morale at the Crown research institute as its board and management pushes ahead with its Future Footprint plan. Says no-ones dares to speak up, dares to say a word of criticism or utter a different opinion ... Management has a lot of power. A date on the final decision for AgResearch's plan to slash jobs at Invermay will be made is indicated in a written statement. After repeatedly declining to say when a decision would be made, an AgResearch spokesman announces it would confirm its plans 'in the next couple of months to enable the design phase to commence. Public Service Association union members urge AgResearch to put its Future Footprint plans on hold and rework the proposal with good levels of genuine community, stakeholder, staff and union engagement. Future Footprint is a $100 million restructuring plan aimed at improving and modernising AgResearch's facilities, allowing staff to contribute to New Zealand's economic growth. Much of the plan would be funded through the disposal of under-utilised assets, which would result in the loss of about 80 jobs from Invermay. PSA assistant secretary Jeff Osborne says the association had 60 union members working at Invermay. The union believed the progression of Future Footprint, as it stood, carried undue risk to the future of AgResearch and its members. AgResearch announces the appointment of a project management firm to plan and manage the delivery of its campus plans, including the development of its parts of the Lincoln Hub, at Lincoln and the FoodHQ hub at Palmerston North. Lincoln University’s vice-chancellor Andy West welcomes the announcement, describing it as positive. Another top staff member at AgResearch has resigned, citing its restructuring plan as a reason for leaving. Invermay's top science manager, Jason Archer confirms his resignation to take up a position at Dunedin-based agricultural science consultancy company AbacusBio. Dunedin North Labour MP David Clark shows the appointment of an external company to manage AgResearch's restructuring plan shows it is now in panic mode. The comment came after AgResearch appointed Christchurch-based The Project Office to manage its $100 million restructuring plan including the Lincoln hub.